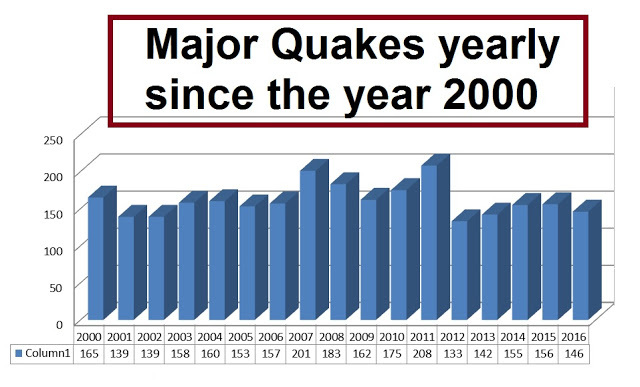 Last year at this stage of the year 41 major quakes had been registered, 2015 was a very quiet start to the year but even so still had registered 30 major quakes by April 15th. 2014 had recorded 49 and 2013 41. 2012 which recorded the lowest yearly total of major quakes this century with 133 had registered 44 major quakes by April the 15th of that year and of course the Fukushima year 2011 had recorded an astonishing 109. 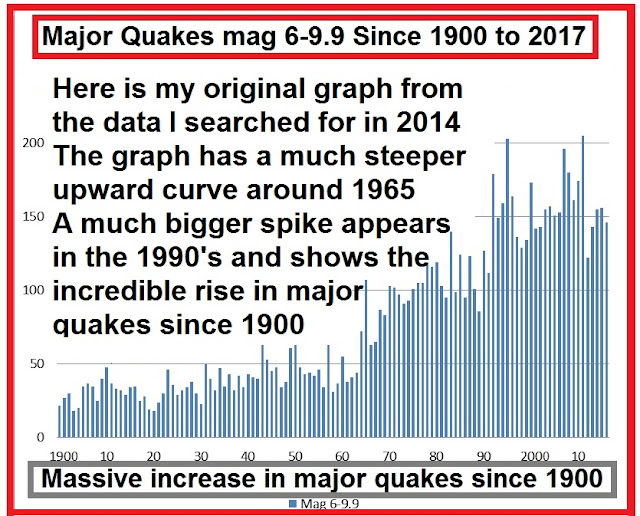 These statistics are wonderful news for USGS who have claimed major quakes are not on the increase, however this year’s total so far is astonishingly low, at the moment 2017 is yielding 6 major quakes per month which would give us a grand total of 72 for the year, we have to go back 50 years to the 1960’s when so few major quakes were recorded. Click on graph to enlarge, graph Gary Walton statistics USGS. 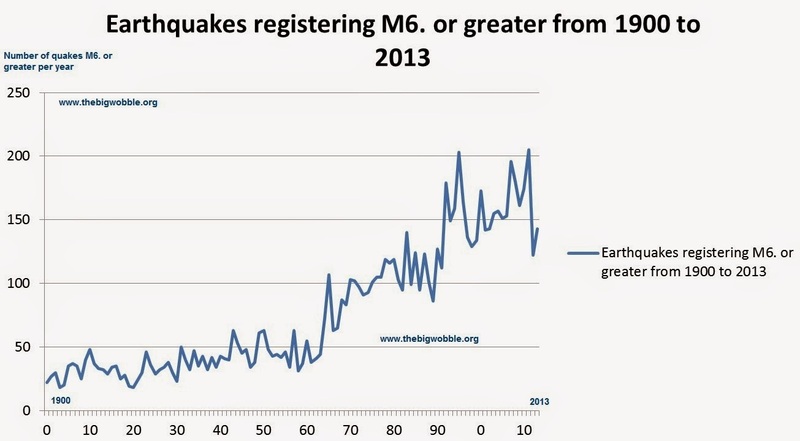 It is a well-known fact that the United States Geological Survey (USGS) have gone on record as saying major quakes are not increasing, they have stated that no such increase has been detected around the world. 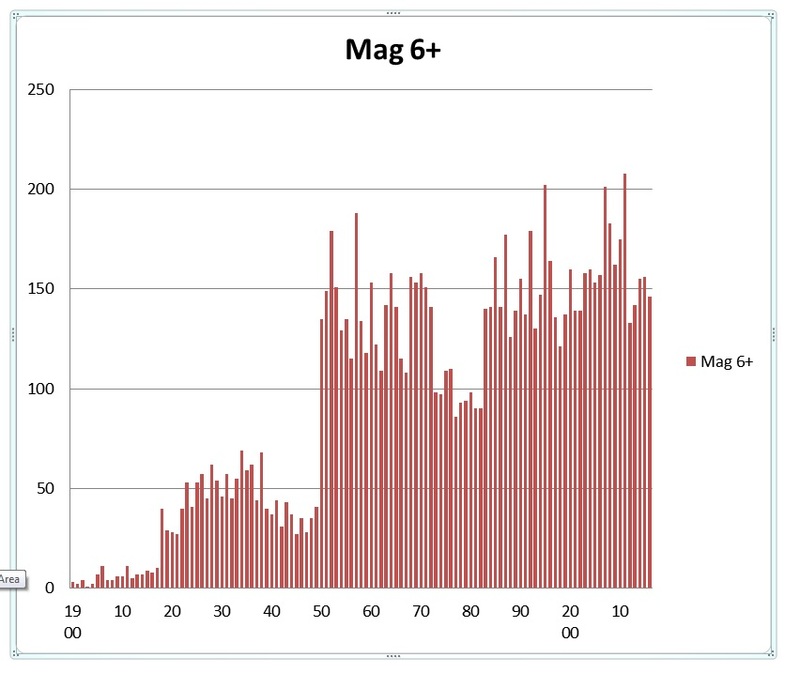 This surprised me, because in 2014, I downloaded every quake from mag 6; upwards from 1900 to the end of the year of 2013 and placed all the data on a graph, supplied below. Because of the press statement I went back to USGS and did the exact search, I checked and downloaded ever mag 6+ quakes from 1900 to 2016 this time. 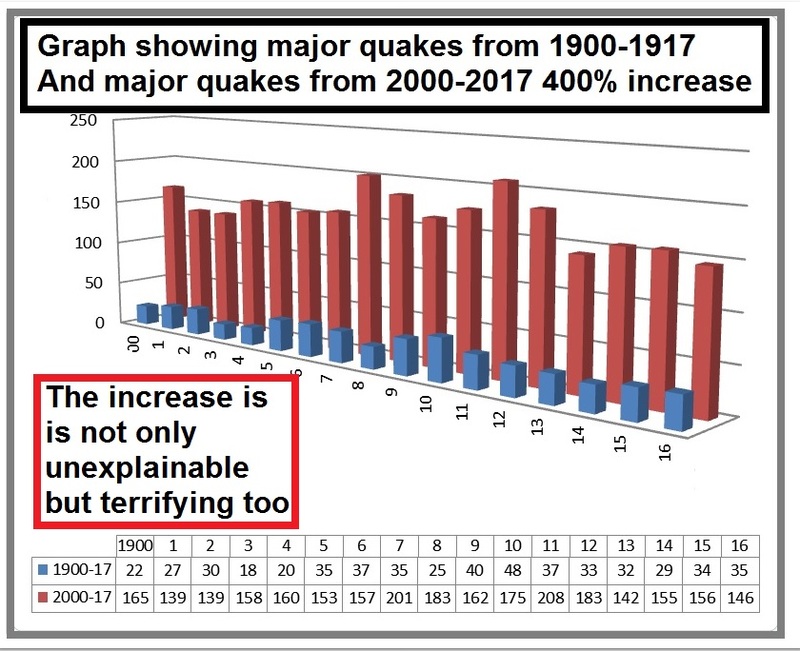 Imagine my shock and surprise when I realised the data had been altered making the graph more stable and without a steep upward curve, the picture the new graph gave was major quakes have been stable, which I can tell you is not the case, they cooked the books! 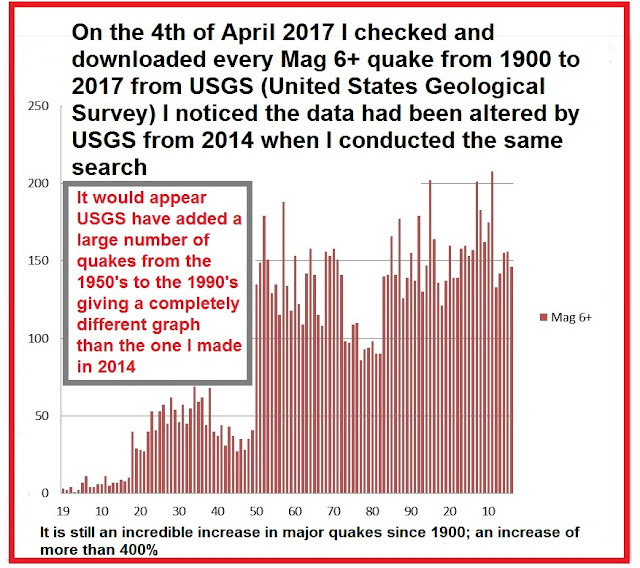 If we take USGS’s new data, which I down loaded on the 4th of April 2017 major quakes have been relatively stable since the 50’s and the big picture looks good. However if we take the data from the 2014 search (original graph above) we find the results are absolutely terrifying and major quakes are increasing at an alarming amount and on top of that we are also aware of USGS downgrading many major quakes, so the picture in reality is probably even more terrifying. 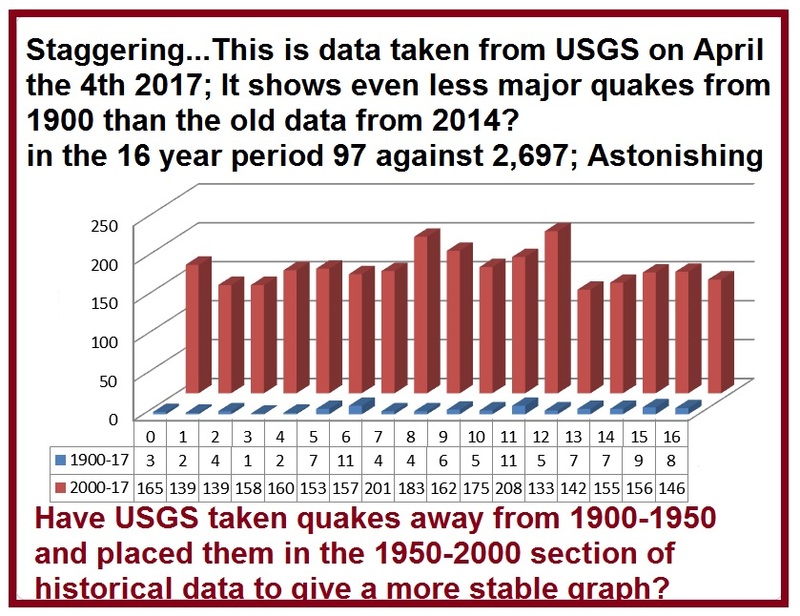 No matter what you have heard, the graphs on this page is the compiled data from the USGS website, first downloaded in 2014 and then downloaded again in April 2017. 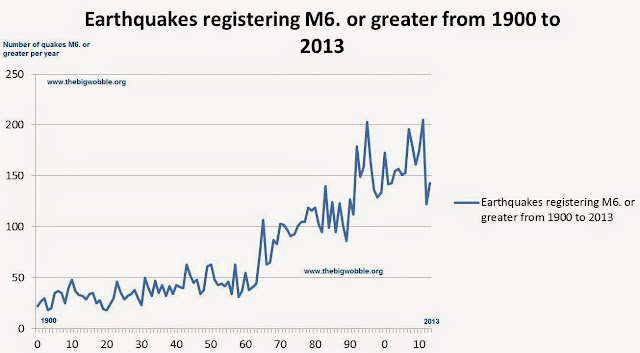 Have USGS altered the data to stop people from panicking? The data you are seeing on this page is data the USGS and other organisations do not want you to see. This graph below is from my 2014 data if I use the new 2017 data we have a completely different picture as the graph above. Did USGS take historical data from the period 1900-1950 and place the data on the historical data of 1950-2000 to create a more stable graph? 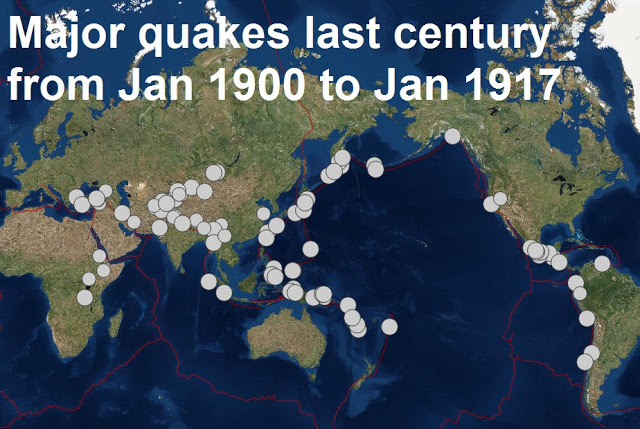 Below is a map showing all the major quakes around the world from 1900 to 1917 just 97. Above is a graph of major quakes this century, it looks very stable but...Can we trust the data? 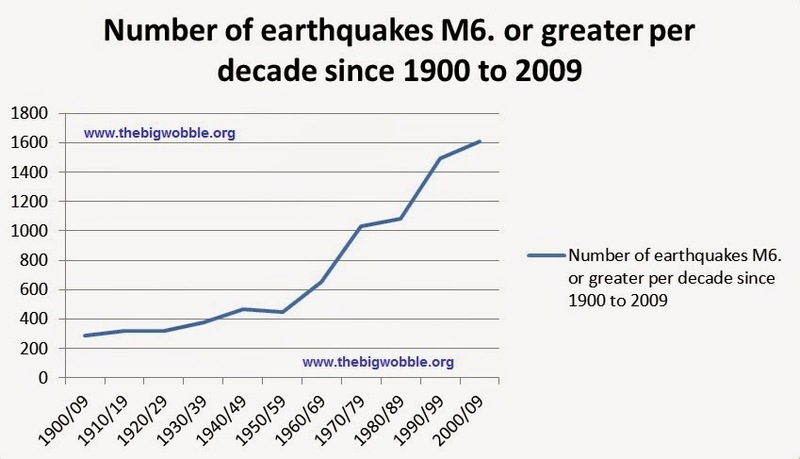 Below a graph from my old 2014 data showing mag 6+ quakes per decade showing a more pronounced spike. 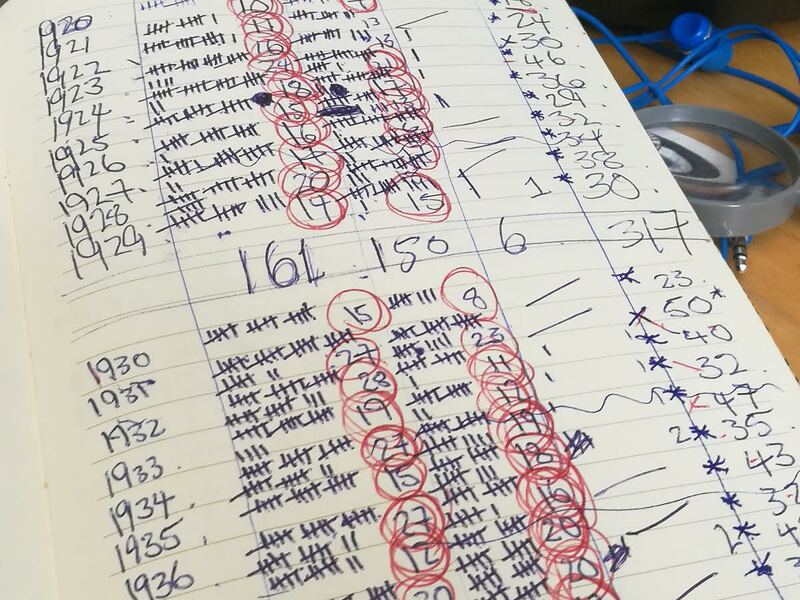 If one was to do the same search now the total would be 10,998, from Jan 1st 1900 to the 31st of Dec 2016 the total would be 10,998 quakes. What does that mean? Since 2014 when I did my original search an astonishing 1,817 mag 6+ quakes have been added. 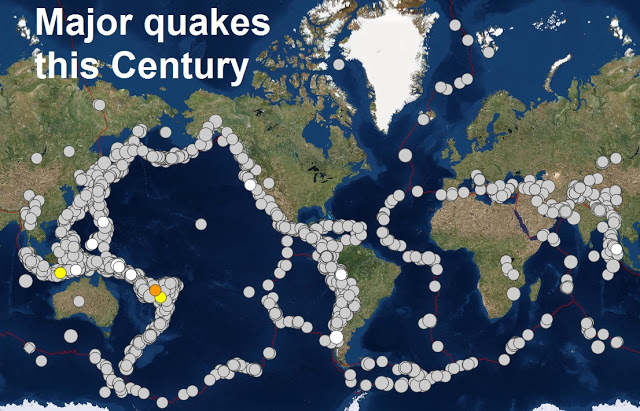 Why would they add more quakes? Because if the data is put together in a graph it will make the graph appear more stable, more of a flat line, see below. 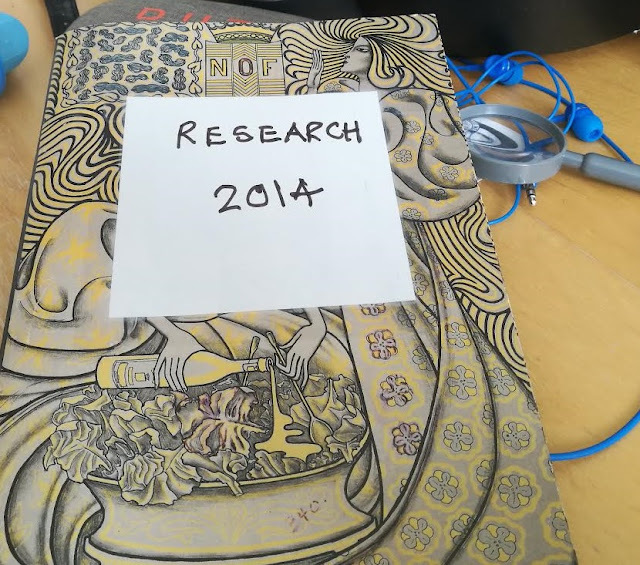 And below my old 2014 research book...Full of wonder! 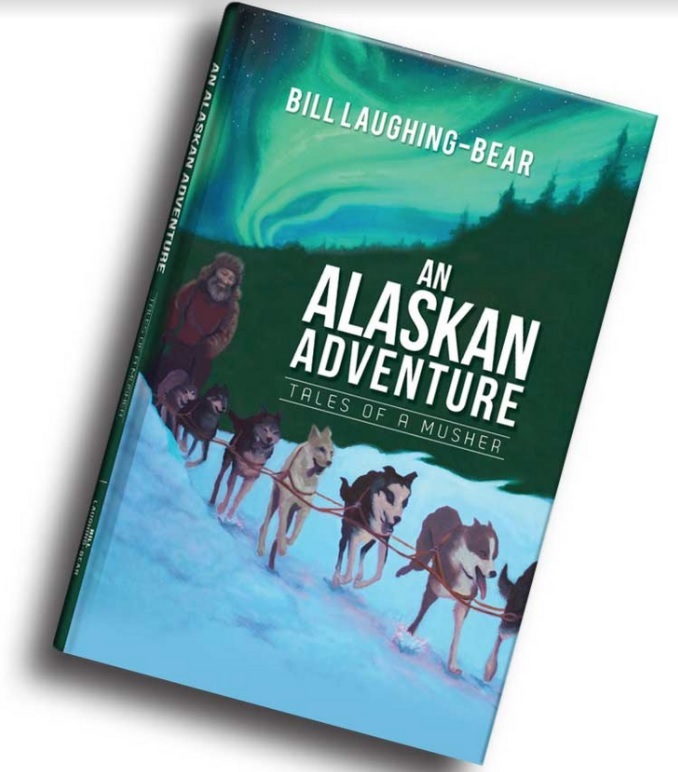 I will not make this into a prophecy post because not all of you reading this will be religious, however I do want to mention what Jesus warned all of us more than 2000 years ago when he told us all of bigger earthquakes in unusual places will happen in the last days, how many time are we hearing that quote recently, "we are in the last days".